See, now, right off the bat, you guys are all making a mistake. 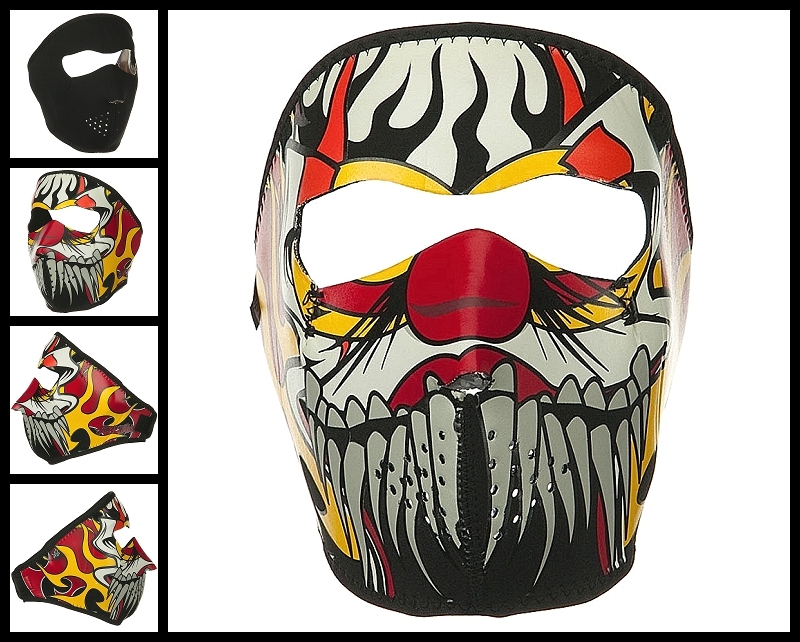 You're looking at this Neoprene Face Masks and thinking "Iron Horse Helmets, why do you support Lethal Clowns?" and that's because you're RACIST because it's not anything to do with Killing clown, that's STEAM from the little box of authentic Mexican tamales. Yeah, and now you're saying "Iron Horse Helmet, shut up, the Lethal clown looks nothing like authentic Mexican tamales." and that's also because you're RACIST because, what, you think all Mexicans know how to cook perfect tamales? Like it's in their genes or something? I got a Mexican friend (Jose), he can barely heat up a can of soup. If his wife's out of town he calls ME to help him order a pizza. If he tried to make tamales there's a 85% chance they'd end up as little tiny sticks in a deep fryer. Really, what you should be focusing on is the warm waterproof neoprene on this mask. What is that thing on his nose? Is that challah? Because if you show me a movie theater where I can get orange soda and challah at the snack bar, I'm putting down the cash for two season tickets. That's right, two. I'm not going to let the poor guy sit at home after I used him as an example. RACIST.